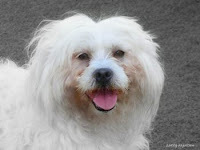 ...or more accurately, it's SeniorPooch.com's birthday. This past Monday was the one year anniversary of the first post posted for the site. Sure... technically the site was up several months prior, but inspiration didn't take hold until a while later. During the past year there have been a lot of memorable moments, including recognition from the local and international communities, reconnecting with the rescue that inspired me to take a second look at senior dogs, and most important: assisting in bringing senior dogs and their forever families together. 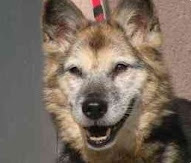 It has also helped me meet many interesting and caring people who have been kind enough to share their knowledge and experience here on SeniorPooch.com, as well as directly supporting finding fosters and forever homes for dogs that have crossed my path. He's a good little boy, who still has plenty of fire in his belly and a lot of love to give to his new family. I wish them all my best. Our friend, above, is Maple. 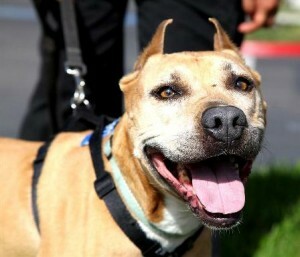 Maple is the perfect dog and remains available for adoption. Her ad and several testimonials from volunteers who have handled her are on the Adoptions page. Head over there and check her out when you can.